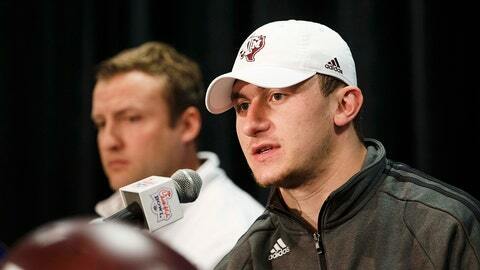 Texas A&M Aggies quarterback Johnny Manziel speaks at a news conference for the Chick-fil-A Bowl. Speculation about the futures of quarterback Johnny Manziel and wide receiver Mike Evans at Texas A&M may soon be coming to an end according to a tweet from NFL.com senior analyst Gil Brandt on Monday. According to Brandt, Manziel and Evans will be suiting up for the Aggies for the final time as Texas A&M faces Duke in the Chick-fil-a Bowl in Atlanta on New Year’s Eve. Manziel has remained neutral when talking to the media prior to the Aggies’ bowl game, saying he did apply for a pre-draft evaluation from the NFL, but is "nowhere even close" to announcing whether or not he will forgo his final two years of eligibility and go pro. During a news conference Sunday, Manziel was quite reflective of his time at Texas A&M, adding fuel to the fire that Tuesday will indeed be his last time donning a maroon jersey. "I’ve had a great time in College Station this year, had a great group of friends, a great group of teammates that have been around me since things kind of changed back in August," Manziel said. "But life’s been good." Manziel is expected to be a top-10 talent according to many draft experts, and Evans is considered one of the top receivers expected to come out of college. If the duo does indeed go pro, they will join offensive tackle Jake Matthews as three highly touted Aggies seeking new homes in the 2014 NFL draft.